Queensland based industrial equipment distributor Redstar Equipment has lifted the lid on its newest high pressure compressor unit, the RCPS 1200-330 from Chicago Pneumatic. The company says the new model, which has a capacity of 1200 cfm and an operating pressure of 330 psi, is well suited for most drilling applications. Chicago Pneumatic product manager for portable energy Amit Bhargava says the unit answers to customer demands for a reliable and efficient product. "The drilling industry has been asking for mechanical rather than electronic engines and we have provided exactly hat," he says. "The Cummins mechanical engines are tried and tested and covered by International Cummins warranty, and allow for easy maintenance and repairs in the field compared to electronic alternatives." All regular service points for air, oil and separator filters are accessible through one common service door. In addition, the unit has also been designed specifically for truck or rig mounting applications. According to Chicago Pneumatic, the RCPS 1200-330 has the smallest footprint, lowest weight and lowest height in the market. "Specifically aimed at truck mounting installations, the new RCPS 1200-330 high pressure compressor has been designed to be extremely compact and low weight to allow for extra space for boosters and other ancillaries to be mounted on the same trailer," Bhargava says. Its low height makes it possible for the units to be mounted on drill rigs with enough clearance for the drill mast when lowered for transport. 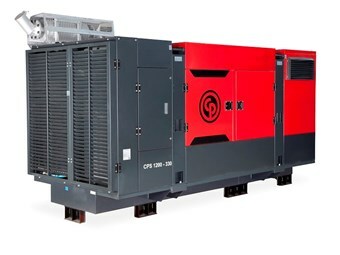 "These compressors are supplied without integrated fuel tanks to allow customers the flexibility to customise this element to their needs," Bhargava adds. For more information, visit Redstar Equipment’s website.